I feel like I start many of my posts bemoaning the fact that the weekend just isn’t long enough to actually be productive when you’re in a country that isn’t your own and this post will be no different! It’s easy to get trapped in Tokyo on a weekend as it’s such a huge city, and it’s certainly easy to feel like you don’t need to leave to find fun things to do. My love of football is helping on that side of things though, and I find I’m actually visiting a lot more places that are off the beaten path so to speak than I expected to. There are a number of teams in and around Tokyo as well as plenty in the surrounding prefectures, so there is never a shortage of options when it comes to a day trip on the weekend. Note my use of the phrase ‘day trip’. Whilst it’s good to visit these somewhat random places, there is often a reason for them being left off many tourist itineraries. 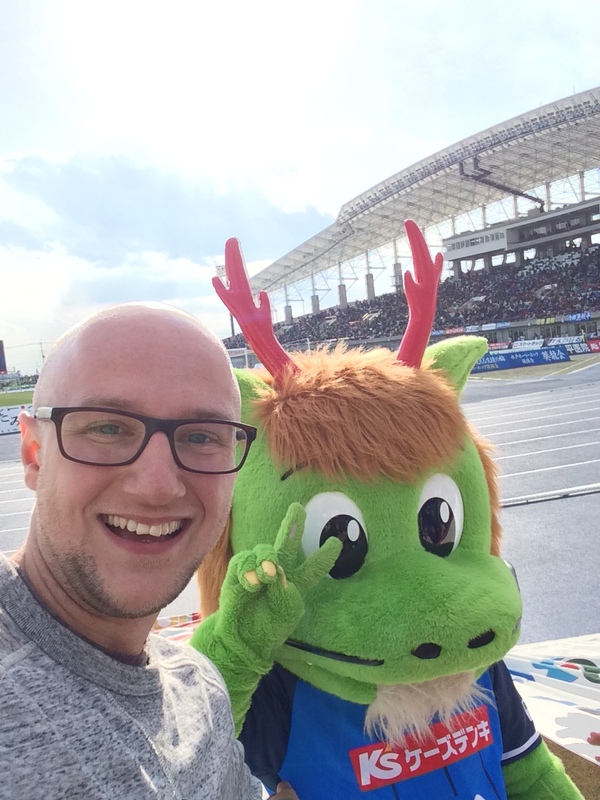 On the opening weekend of the J-League season, I discovered why Mito is one such city. Because I’ve got nothing else to go in this space, here’s a picture of a statue of soy beans. After a 7am wake up call and an almost three hour train ride up to Ibaraki – can you still play the ‘day of rest’ card if you don’t believe in god? – I arrived at Kairakuen Gardens to meet Glen (aka Tokyo Fox) for a wander around Kairakuen park. And there was me thinking it was going to be a quiet, leisurely stroll around the park! If you think 7am is a bad alarm to set for a Sunday, Glen was on the train at 5.30am as he had a temple he also wanted to tick off his list on the way! I politely declined. 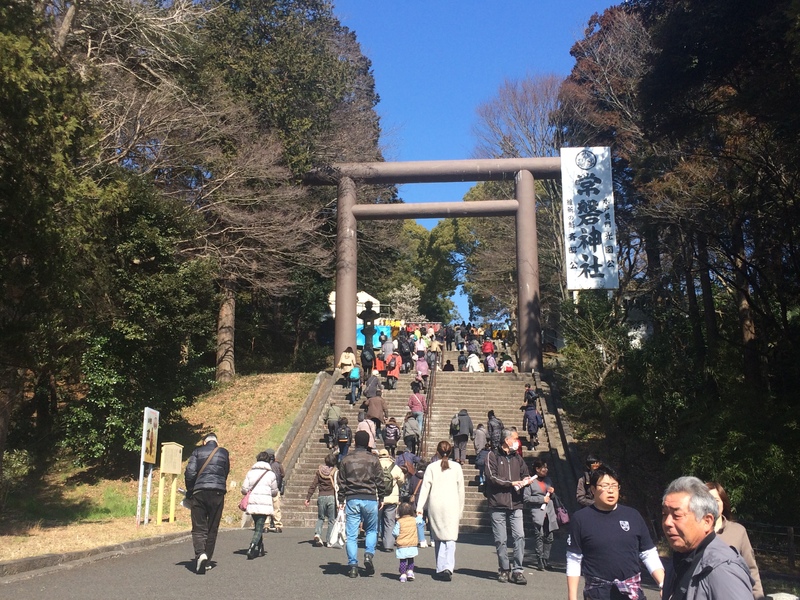 I imagine Kairakuen is a pretty standard park on most given weekends, but this weekend it was bombarded with locals and tourists alike as well as chancers selling all sorts of food and souvenirs as the plum blossom trees were in bloom. Now as you’ve probably heard me say many times before, a temple is a temple and I think the same can be said for blossom trees too. 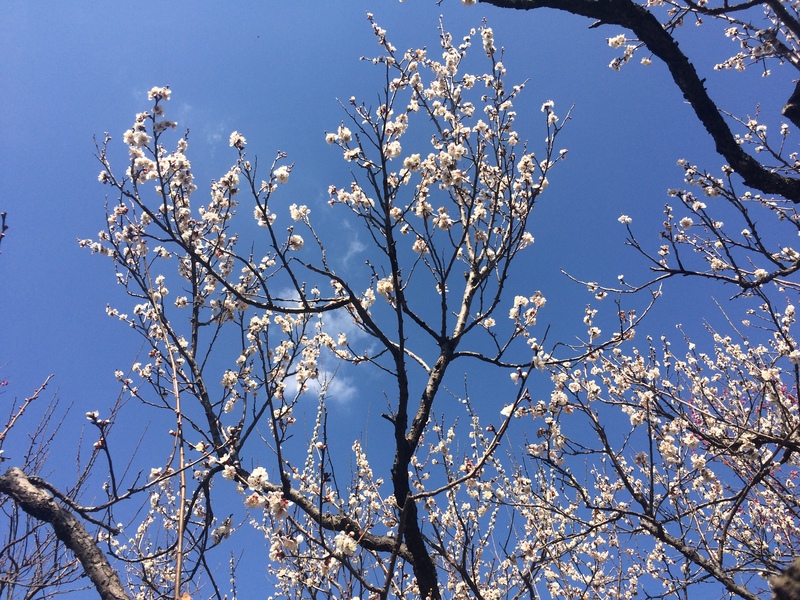 The cherry blossoms in Spring are nice enough, and to be honest the plum blossoms were alright too. That’s it, just alright. Nothing to write home about, although I guess technically I’m doing exactly that right now. Plum blossoms. Or are they cherry blossoms? Who knows. 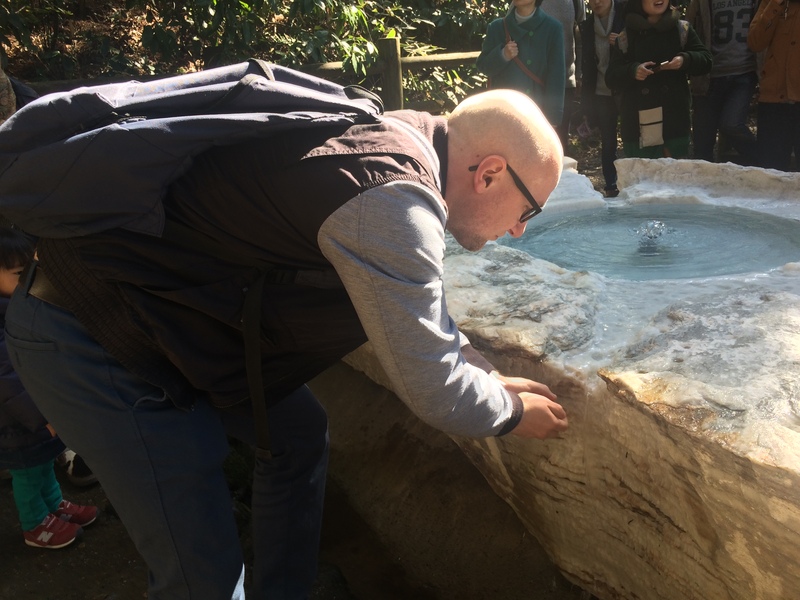 There was also a natural spring in the park too which, to my surprise, was absolutely tiny and surrounded by people just staring at water. Each to their own, I guess. With it being a natural spring though, some people took the opportunity to have a quick wash and a drink. 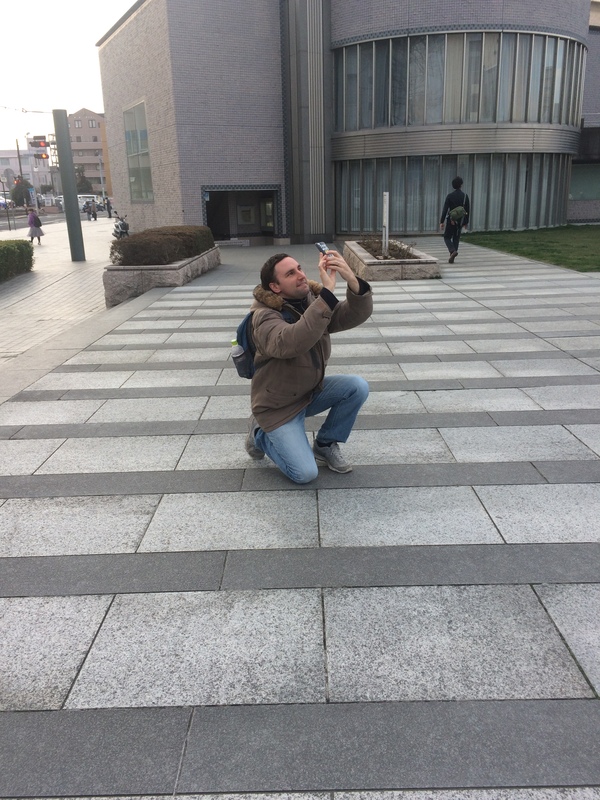 Naturally, this gaijin tourist couldn’t resist the opportunity for a photograph. The things I do for this blog. Embracing the culture as usual. The focal point of our day out was, as usual, the football! We had left Kairakuen with time to spare (turns out an hour is way too long to look at trees), so we arrived at the main station with just under two hours to spare until Mito Hollyhock opened their season against Shonan Bellmare. Behind the scenes of a Tokyo Fox blog post! 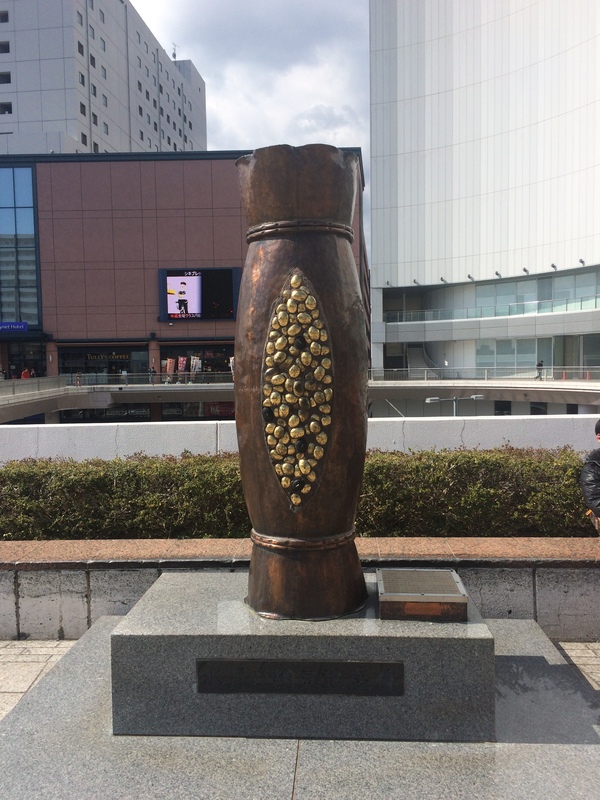 This afforded us the opportunity to see all the sights around the station including a statue of fermented soy beans and erm…yeah. In hindsight it was a good thing we got to the station early as despite only being about 4 kilometres away, the bus journey to the ground took the best part of an hour. Had I not been nursing a monster blister from my new work shoes I’d have probably been happy to walk it! 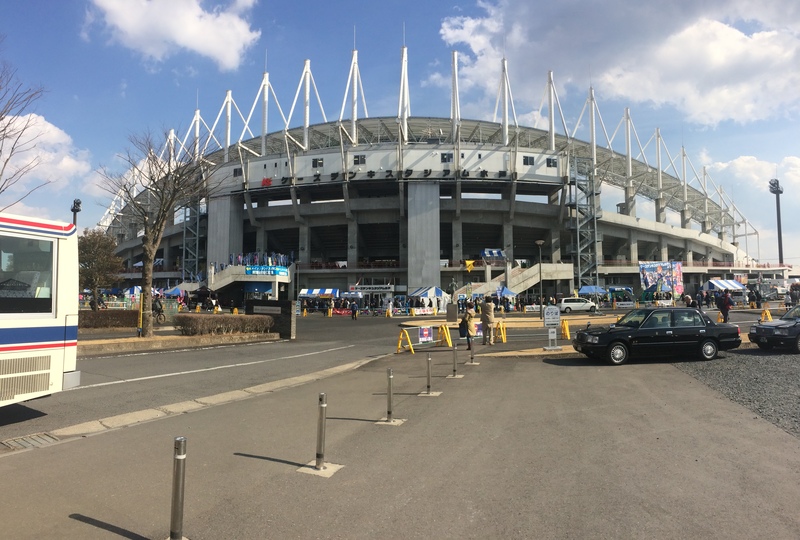 K’s Denki Stadium. These stadium sponsorships are getting more and more ridiculous by the day. Anyway, we arrived at the ground with just a few minutes to spare and plumped for the cheapest tickets, which allowed us to sit on the grass behind the goal. 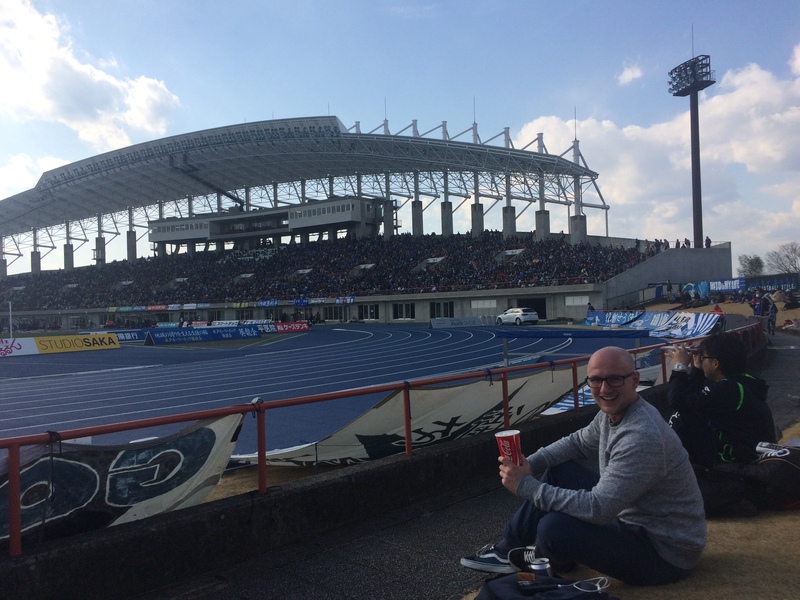 Not the best view considering the sponsor boards and the running track between us and the pitch, but what do you expect for ¥2,000?! ¥2000 gets you your very own patch of grass. Beer not included. I feel like the theme of this post should be along the lines of ‘the less said, the better’ as the match itself provided us with very few talking points. After a fairly lively opening 10 minutes, the game drifted into dullness and was eventually settled when Shonan converted from a fairly nice corner routine to score the only goal of the game. Perhaps the highlight of this game however was the fact that despite being sat in front of the action, Glen still managed to miss the only goal because he was messing around with his phone or something similar! This felt like karma to me, as the same happened to me whilst getting his fries at a Machida Zelvia game last year! Never mind the camera adding 10 pounds…my camera adds 10 chins! 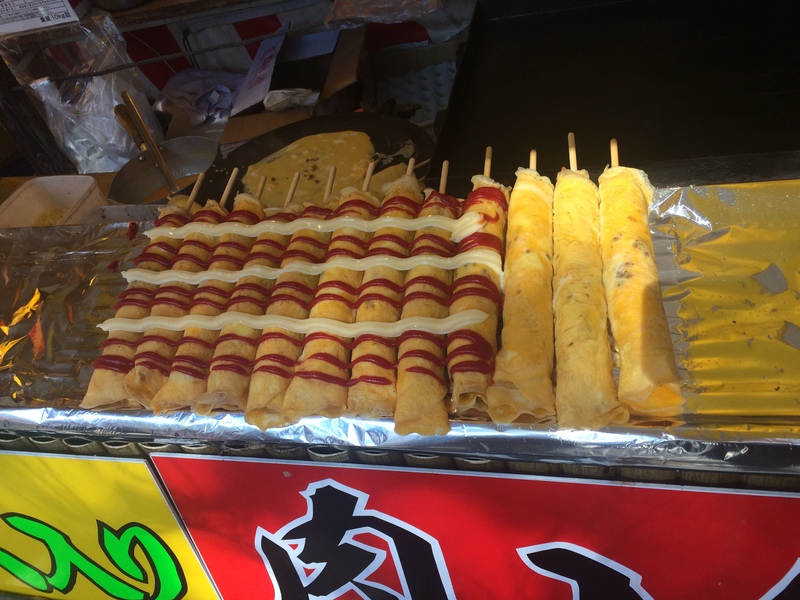 Of course no trip to another area of Japan is complete without trying the local delicacy. As per usual, I was armed with instructions from my students with regards to what to eat. This week the food of choice was to be natto due to Mito being the home of the slimy, stinky, fermented soy bean foodstuff. 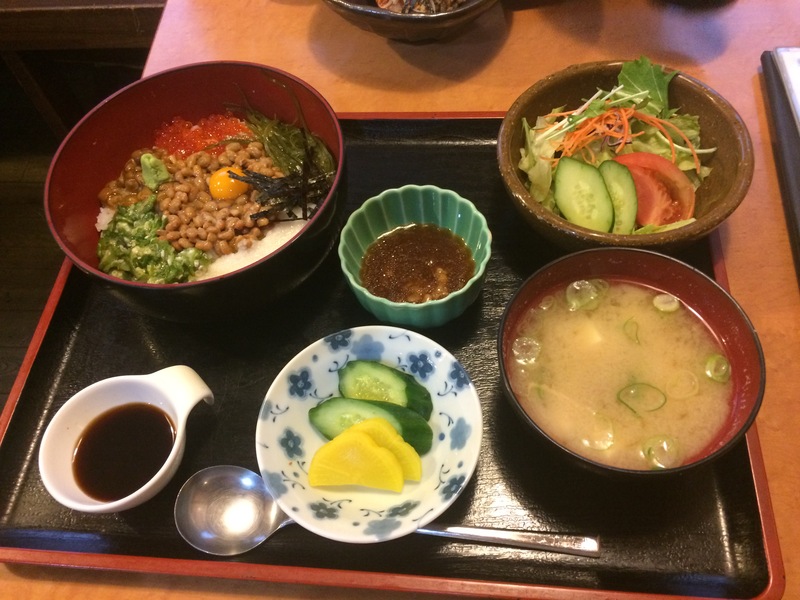 I actually like natto and think everyone should try it if they visit Japan, but was a little apprehensive as to how different it would taste just a few hours away from Tokyo. 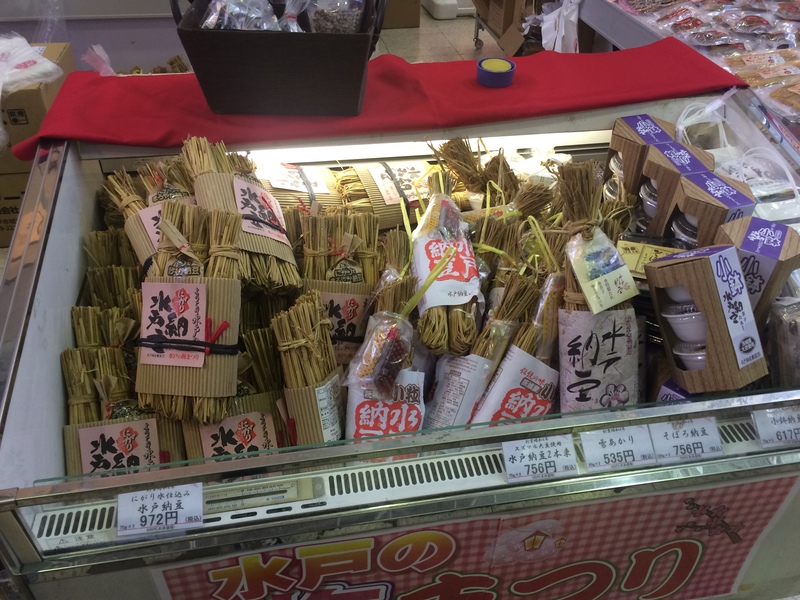 After all, I was told the very same thing about soba in Nagano the previous week and was a little underwhelmed. ¥80 in the supermarket. Wrap it in straw and you can charge ¥900+ apparently! 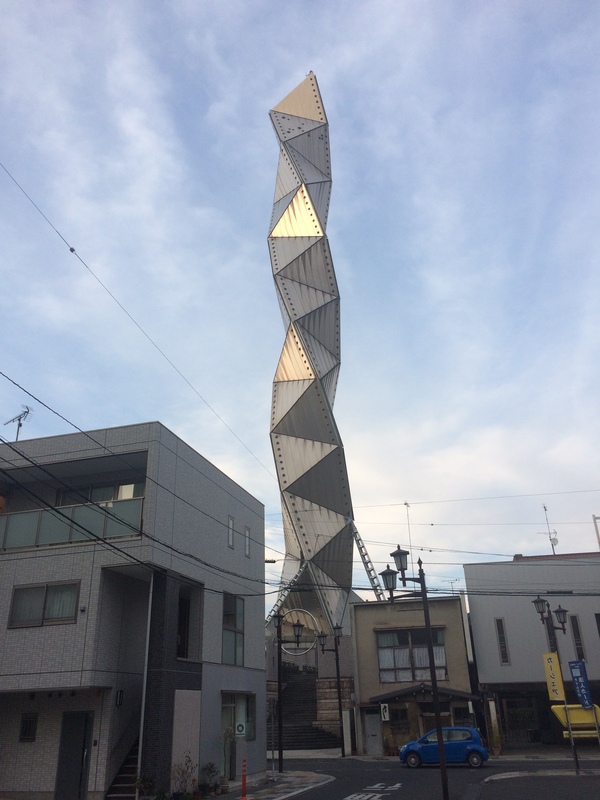 After getting off the bus one stop early to take a picture of another metal structure we headed to Tenmasa izakaya just by Mito station which had an entire section of the menu dedicated to natto. One of the ‘must-see’ sights in Mito. Unfortunately there was no English menu so it was up to our fairly limited Nihongo skills and Google Translate to decipher what we wanted to order. Naturally natto was the order of the day so we opted for a few variations of that. 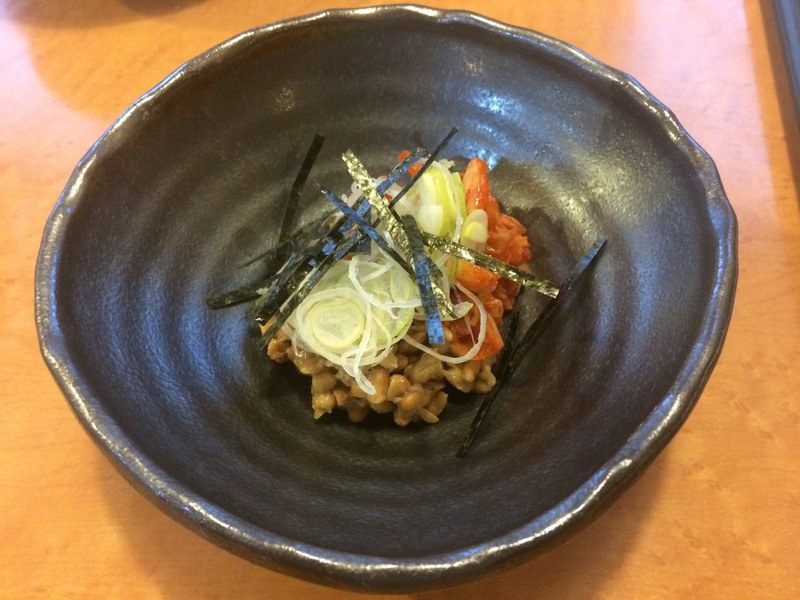 Kimchi and natto – can be made at home for a combined cost of about ¥100! 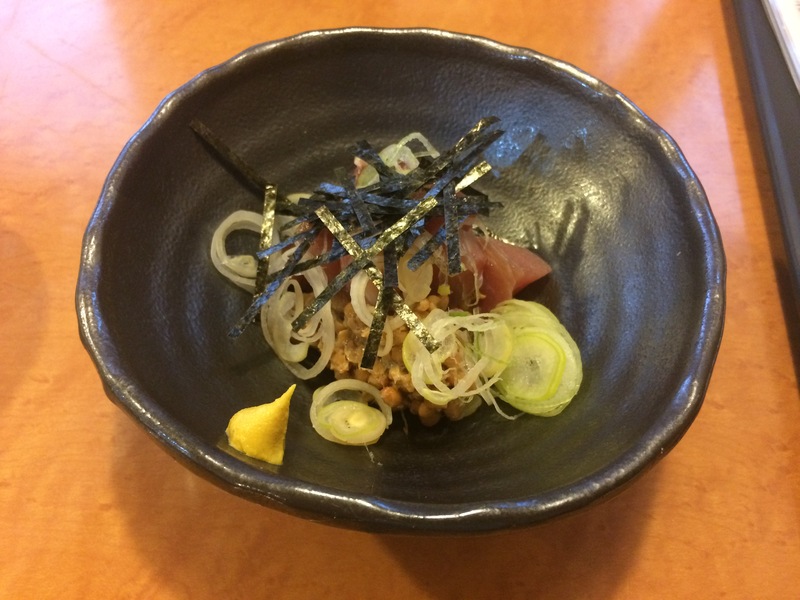 What followed was a few very small servings of natto topped with kimchi in one dish and tuna sashimi in the other. Now I often buy natto at the supermarket and ¥80 can get three packs (although Glen would claim that he pays ¥20 for one so maybe my tightarse radar isn’t what it once was) so to be paying ¥500 for one serving topped with a bit of kimchi seemed a bit excessive. It was nice, but I’m not sure I’d pay it again. Would you like some food with your bowl? The main event was the ‘nebari donburi’ set which came recommended by The Japan Times for ¥1000. This consisted of a bowl of rice topped with natto, okra, salmon roe and a load more unidentifiable slimy things. Definitely worth wearing a bib with this one. This was accompanied by a side salad, some pickles and a bowl of miso soup which – to our surprise – also contained a clump of natto. Good job I like the stuff! That’s more like it! Bowl of fermented soy beans, anyone? The meal was rounded off with a helping of fried potato circles (natto overload) and we made our way back to Tokyo. Glen’s early start caught up with him and he took the opportunity for a nap on the way home whilst I worked through a few more cans of Asahi. A long day came to an end as we arrived back in Tokyo at around 9.30pm absolutely shattered. It wasn’t the most rewarding day out but as the saying goes: nothing ventured, nothing gained! 80 yen for three packets!! Someone’s doing well!!! More like someone can’t be arsed traipsing round Tokyo to save ¥20!